Citation: Xie Q, Tang S, Wang Z, et al. The prospect of sweet sorghum as the source for high biomass crop. J Agric Sci Bot 2018;2(3):5-11. To reduce the world’s reliance on traditional fossil fuels, alternative fuel sources are being developed. The most common renewable fuel today is ethanol. Sweet sorghum has been developed as a potential source for bioethanol production. Comparing to other energy plants, sweet sorghum provides high biomass yield, high sugar/ethanol yield, and ability to grow on marginal land areas. The economic cost of growing and harvesting sweet sorghum for its fermentable carbohydrate is also analysed and found favourable compared to that of maize. Future studies on genetics will be focusing on reducing lignin content and improving biomass productivity of sweet sorghum. Sweet sorghum, Bioethanol, Biomass, Sugar yield, Biorefinery, Feedstocks. There are major concerns over the future of traditional fossil fuels as the primary energy source for the society. Parts of these concerns are due to the fact that these fossil fuels cannot be replenished therefore extracting and refining these fuels have become increasingly expensive. This has prompted major interest in the development of renewable energy sources such as wind, solar powered energy and bioenergy, as alternatives to the diminishing fossil fuels. Of these types of renewable energy sources, bioenergy has shown great potential as a complement to fossil fuels on an industrial scale. Biofuels have been proposed as an alternative way to reduce the reliance on traditional fossil fuels and greenhouse gases emission that are responsible for climate change . In countries such as the U.S, approximately 20 million barrels of crude oil are consumed daily with 60% of the total volume imported. A national goal is set up so by 2012, 7.5 billion gallons of renewable fuels have to be blended into gasoline . In China, coal consumption takes up 70% of the country’s total primary energy consumption and 80% of coal is directly burnt without proper pre-usage treatment that would ensure minimal pollutants exposure to the public  hence, the Chinese government has prioritized the research on the development of renewable and environmentally sustainable energy . Among various forms of biofuels currently being developed, the most common is ethanol. In 2008, 9.2 billion gallons of ethanol were produced in the U.S. alone , and even though grain-based ethanol production is expected to increase, the supply still falls short of the total demand, and there are potential negative effects on food and feed supplies. Therefore, alternative ethanol production from crops that do not compete with food and feedstock supplies will play an important part in providing bioenergy . In the U.S, the major raw material used for the production of ethanol is corn grain. The US has the potential capacity to produce 13 billion gallons per year from maize alone . In Brazil, the National Alcohol Program (ProAlcool) was created in 1975 to help the nation tackle increasing fossil fuel price and sugar overproduction. This program was based on using sugarcane as source for ethanol with the intention of targeting the large scale use of ethanol as a substitute for gasoline . With significant government support to increase the supply and demand for ethanol, Brazil is able to develop large scale renewable energy usage capabilities. However because maize have implications other than ethanol production, and sugar cane has strict requirement on temperature and other conditions, there is an upper limit as to how much ethanol can be produced from these two crops alone therefore feedstock that are typically grouped under ‘biomass’ and include agricultural residues, wood, municipal solid waste and dedicated energy crops are also utilized for ethanol production. There are limitations that will influence the types of energy-cropping systems that will be sustainable. The main limitation is the amount of land area and agricultural resources that can be made available for energy crops, without compromising food production. Thus maximizing the energy that can be generated from energy crops per unit land area, whilst minimizing the costly inputs, such as water and fertilizer and fuel, is a priority . Current bioenergy crops include maize, sugar cane, sweet sorghum, switch grass, cassava, and other less development varieties. Maize has traditionally been used in the U.S for ethanol production; while in Brazil, sugar cane is more widely planted as source for ethanol. Of these energy plants, many are C4 grasses. Among these C4 plants, one that has enormous potential for ethanol production is sorghum. Sorghum is the second most important feed grain grown in the U.S. in terms of planting acreage, and is also planted in areas in India and countries in Africa. Grain sorghum is a high biomass C4 plant which can produce not only grains but also bagasse, both can be served as resources for ethanol production. However, currently there is only one species of sorghum, Sorghum bicolor, that has the potential to mass produce ethanol. Sorghum bicolor, or better known as sweet sorghum, has three different components which can be used for ethanol production: grain, bagasse, and the juice [9,10].The juice extracted from the plant stalks contains plenty of sugars, such as sucrose, glucose, and fructose, which can be directly converted via biological fermentation process into ethanol [11,12]. Sweet sorghum is an important crop in marginal lands, and as fuel prices increase and water usage for irrigation becomes more limiting, its importance is expected to increase furthermore . Sweet sorghum exhibits several better characteristics over the other energy crops, e.g., drought and salt tolerance, has a short period of growth (up to 4 months) and requires less water and fertilizer leading to a low cost of production [14,15]. As part of China’s comprehensive energy plan, its bioenergy industry is vigorously accelerating cellulosic ethanol fuel production and diversifying feedstock supplies to include new crops such as cassava and sweet sorghum. In 2020, ethanol yield will reach 4.0 million tons, 90% increase from 2.1 million tons in 2015, according to the 13th 5-Year Plan for bioenergy development released by the National Energy Administration of China . In the U.S, such increase in sweet sorghum acreage has occurred already due to rapid development of grain-based ethanol refineries. This is already evidenced in a 19% increase in sorghum acreage in 2007 as compared to 2006 . This review focus on the advantages sweet sorghum offers as a source of ethanol and its future for mass plantation. In terms of ethanol production, sweet sorghum provides many advantages over other bioenergy crops such as maize and sugar cane. This review will discuss three of the most important traits of sweet sorghum: high biomass yield, high sugar/ethanol yield, and the ability to grow on marginal land areas. Sweet Sorghum, a C4 plant, is an ideal energy crop because it possess the following traits that would enable it to accumulate biomass: high conversion efficiency of light into biomass energy, high water use efficiency and high leaf level nitrogen use efficiency , ability to grow in marginal land areas , and a relatively high tolerance to soil constraints such as salinity and water concentration . All these traits of sweet sorghum come from their ability to utilize radiation efficiently, comparing to C3 plants, C4 plants have high radiation use efficiency (RUE). C4 plants utilize a photosynthetic mechanism whereby CO2 is pumped into specialized cells surrounding the vascular bundles, where Rubisco is exclusively localized, and CO2 can accumulate to levels in excess of ten-fold atmospheric concentrations in these cells . Atmospheric CO2 from intercellular spaces of the mesophyll cells is fixed by PEP carboxylase into C4 acids which move to the bundle sheath cells to be decarboxylated and release CO2. The high RUE of C4 plants is directly related to this CO2 concentrating function as photorespiration is almost totally inhibited in C4 plants and Rubisco operates at close to its maximum capacity. In the case of sweet sorghum, this high RUE, together with its relatively short growth period comparing to other potential energy plants, result in sweet sorghum being able to accumulate more biomass comparing to others when given the same amount of solar energy (Table 1). Table 1. Biomass yield and the subsequent ethanol yield of maize, sugar cane, sweet sorghum and cassava. Sweet sorghum has such high levels of sugar in the stems thus that either ground, fresh harvested or dry stem maybe fermented directly. This process has been shown to yield 100 litre ethanol per ton of stalks, where 0.46 gram ethanol was generated per gram sugar . Sweet sorghum had the greatest ethanol yield potential than Maize and high biomass sorghum at the two marginal locations in Midwest USA over this five year study . Solid state ethanol production can also overcome problems with the short shelf life of high-sugar biomass, as dry stem tissue can be stored for up to eight months . Calculated ethanol yields from sweet sorghum stem juice, approximately 10,000 litre of ethanol per hectare  may exceed that of sugarcane. Sweet sorghum generates high sugar yields over a wide range of geographical locations, from four tons per hectare in cooler areas, up to 12 tons per hectare in warmer climates . Crop duration also impacts final potential yields. In warmer climates it is possible to harvest two crops per year from sweet sorghum; whereas only a single sugarcane crop can be harvested in a year. These factors combined to make sweet sorghum one the most efficient plant for ethanol production (Table 2). Table 2. Sugar Content and subsequent ethanol yield of sugar cane and sweet sorghum. In many parts of the world, water is the major limiting factor affecting crop production. In such areas, irrigation systems are utilized to maintain crop yield, therefore any failures in the irrigation system would have significant impacts on crop yields. Other than water supply, salinity also has major effect in agriculture by lowering crop yield . Sweet sorghum has the abilities to resist high salinity and low water supply , therefore it fits well in marginal areas where both conditions are abundant [40,45]. Sweet sorghum is more efficient at utilizing water than other summer crops under both drought and non-drought conditions . From the environmental point of view, sweet sorghum requires relatively less nitrogen and water compared to sugar cane, therefore is more environmentally friendly (Figure 1) [48,49]. Sweet sorghum, unlike sugar cane, can be planted in marginal land areas where water supply can be scarce during crop development . Also compared to sugar cane, sweet sorghum exhibits relatively fast growth rate, short maturity time and high total energy value, therefore making it a more viable source for bioethanol production . Moreover, sweet sorghum production is encouraged by new policies regarding non-food crops in places such as European Union . Figure 1. Resource requirements of sugar cane and sweet sorghum. (A) Growth period. (B) Water requirement . (C) Average fertilizer requirement . (D) Pesticide requirement . Many factors can be influential to the viability of sweet sorghum as a source for ethanol production. These factors include production and infrastructure costs, transportation cost, and side product value. For bioenergy production, the types of biofuel sources utilized have series impact on process and facilities economics . Bio refineries that could utilize sorghum as source for bioenergy production are expected to have similar cost compared to those of other modern refinery examples, such as petroleum refining and corn wet milling, in which the cost of feedstock represents a majority (60% to 70%) of the total product value [54-56]. In additional, a new research has found that lower energy cost for sweet sorghum in comparison to two other crops, cotton and maize, respectively, in the saline land in the east coast of China . Fresh harvested sweet sorghum that is seasonally processed as a supplemental fermentable carbohydrate (FC) and fuel source for existing ethanol production facilities appears to be economically sustainable when compared systems that utilize maize. For example, when combustion credits are between $6 and $8 GJ-1, sweet sorghum FC costs are estimated to range from $91 to $149 Mg-1 for a medium sized ethanol plant at a low-density plantation level. This compares favourably to corn FC costs of $171-$258 Mg-1 for corn valued at $157-$236 Mg-1 respectively. In contrast, when using ensilage to store sweet sorghum in bunker silos for year-round use as a supplement source, it is possible to have net costs well above FC derived from corn grain . Despite the advantages offered by sweet sorghum, parasitism, weed and lodging pose serious problems to its industrial scale planation. In sub-Saharan Africa stem borers are major biotic constraints to cereal, including sorghum production. These pests are responsible for losses ranging between 5%-73% of potential yield under different agro ecological conditions . Due to the high sugar contents in the stem of sweet sorghum, older larvae of different stem borers are able to tunnel into the stem tissues and feed internally which not only reduce the sugar and quality of stem but also its resistant to wind damage. Weed is also an important factor in determining sweet sorghum yield. Since sweet sorghum is sensitive to most common applicable herbicides, weed reduction through herbicides can seriously impact yield. Manuel removal of weed turns out to be expensive due to increasing labour cost across the world and especially impractical for large plantations. Lodging refers to the permanent displacement of plants from their vertical stance. In addition, stalk breakage is also observed in those tall crops. Lodging usually occurs close to harvest and sorghums are prone to lodging near harvest. It is a complicated phenomenon influenced by many factors including wind, rain, topography, soil type, previous crop management and disease . Lodging is a major problem for areas with strong wind since high biomass sweet sorghum are very high and heavy; therefore flexibility is reduced when facing strong wind. Lodging in the early stage of sweet sorghum growth will affect its biomass when it reaches late growth stage, while lodging at later stage would pose problems for automated harvest, which is unacceptable from the bioenergy industry point of view. Breeding from different germplasms and agricultural management are traditional ways to improve resistance toward parasitism, lodging and weed control. Recent investigation in Europe also ruled out more research efforts for cultivating sweet sorghum should be focus on harvesting techniques and as well as storage of the harvest . Transgenic technologies have also been successfully applied to different main crops to improve plant tolerance and reduce the management cost [61,62]. Sweet sorghum exhibits great potential as an energy plant for ethanol production; however, there are some improvements needed in order to avoid potential stumbling blocks which would hinder its progression. One of the major stumbling block sweet sorghum faces is the high cost of converting lignocelluloses biomass into ethanol. At present, the cost of harvesting and processing sweet sorghum juice by crushing stems to extract juice is relatively low compared to the cost of harvesting and processing lignocellulosic biomass. The source of the carbon atoms present in lignin polymers and cellulose polymers is the same, that is, carbon assimilated by photosynthesis; however, lignin is not useful as a carbon source for ethanol production because it is made from aromatic structures and the reactions to synthesize lignin are not reversible; whereas cellulose can be easily hydrolyzed to release the six-carbon glucose monomers. Therefore increasing the accessibility of cellulose to enzymes and chemicals has been a major focus for genetic study of sweet sorghum. Accessibility of plant cell wall polysaccharides to chemical, enzymatic and microbial digestion is limited by many factors. One of the more important factors involves the presence of the phenylpropanoid polymer lignin in vascular tissues and fibers. Genes that are responsible for the enzymes leading to the hydroxyphenyl (H), guaiacyl (G) and syringyl (S) building blocks of lignin have been identified. Downgrading some of these genes has revealed the relationships between lignin content and efficiency of lignocellulose use for pulping of trees and digestibility of forages . Other than lignin modification, elucidating the genetic basis of stem sugar and stem juice accumulation, modifying cell wall composition so that sorghum biomass can be processed more efficiently, maximizing biomass yield for a given geographic area and production system, and understanding the different mechanisms underlying drought tolerance  are the main focus areas among sorghum researchers that target ethanol traits. Due to the ability to manipulate targeted specific characters through genes from various sources in classical plant breeding, Bt and proteinase inhibitor genes have been successfully applied to different crops to protect different insect attacks in economic plants . Herbicide tolerant transgenic crops have been approved to be safely and with greatly reducing of labour cost . Thus those genetic modification technologies will be the firstly selected technology for manipulation of sweet sorghum to adopt the environment. Significant opportunities exist to grow sweet sorghum for bioethanol. Advances in genetics and agronomics are likely to accelerate the first phase in feedstock development. Developing sorghum as a model for C4 plants is likely to yield important insights into genetics and trait manipulation in polyploidy species, and the results may help the development of other species in the C4 family. For sweet sorghum grown for biomass, the short-term establishment (5-10 years) in improved yield and quality are likely to be significant. Some significant challenges are ahead. One of the major obstacles will be proving the economic effectiveness of lignocellulosic biorefineries and the ability to sustainably produce the mass of feedstock required within a given region to supply biorefineries. Currently, our knowledge on the potential impact of existing or new environmental stress on dedicated bioenergy feedstocks grown over large geographical areas is limited. For example, will breeding for higher conversion subjects the plants to more environmental stress ? And will reducing lignin content in plants have serious side effects to their growth? Such issues will need to be addressed along with the development of sweet sorghum. Despite the obstacles, the current social, economic and scientific conditions favor the utilization of sweet sorghum and other plants for bioenergy. Sweet sorghum can be planted in marginal land areas in less developed countries and areas, particularly in Africa, to stimulate local economies; and the establishment of flexible biorefineries should allow exploitation of these multiple feedstocks and extend the projected environmental and economic benefits of biofuels. Finally, biorefineries situated in appropriate areas are likely to significantly improve local economies and strengthen a rediversification of agriculture to once again provide food, fuel and feedstocks in an environmentally sustainable manner. This study was supported by Agricultural Breeding Program in NingXia Province (2014NYYZ0401), Key Deployment Projects of Chinese Academy of Sciences (KFZD-SW-112-01) and Youth Innovation Promotion Association, CAS to SY, T.
National Biofuels Action Plan. 2008. The US Energy Policy Act of 2005. 2005. Bureau SS. China's Statistical Yearbook. China Statistics Press. 2007. Lin Cs, Li YY, Liu JL, et al. Diversity of energy plant resources and its prospects for the development and application. Henan Agri Sci. 2006;12:17-23. Yuan JS, Tiller KH, Al-Ahmad H, et al. Plants to power: bioenergy to fuel the future. Trends Plant Sci. 2008;13(8):421-9. Gray KA, Zhao L, Emptage M. Bioethanol. Curr Opin Chem Biol. 2006;10(2):141-6. Goldemberg JNF, St Coelho. Bioenergia no estado de São Paulo: Situação atual, perspectivas, barreirase propostas. 2008. Sarath G, Mitchell RB, Sattler SE, et al. Opportunities and roadblocks in utilizing forages and small grains for liquid fuels. J Ind Microbiol Biotechnol. 2008;35(5):343-54. Li S, Li G, Zhang L, et al. A demonstration study of ethanol production from sweet sorghum stems with advanced solid state fermentation technology. Appl energy. 2013;102:260-5. Nuanpeng S, Thanonkeo S, Yamada M, et al. Ethanol production from sweet sorghum juice at high temperatures using a newly isolated thermotolerant yeast Saccharomyces cerevisiae DBKKU Y-53. Energies. 2016;9(4):253. Techaparin A, Thanonkeo P, Klanrit P. High-temperature ethanol production using thermotolerant yeast newly isolated from Greater Mekong Subregion. Braz J Microbiol. 2017;48(3):461-75. Ren LT, Liu ZX, Wei TY, et al. Evaluation of energy input and output of sweet sorghum grown as a bioenergy crop on coastal saline-alkali land. Energy. 2012;47(1):166-73. Pilap W, Thanonkeo S, Klanrit P, et al. The potential of the newly isolated thermotolerant Kluyveromyces marxianus for high‑temperature ethanol production using sweet sorghum juice. 3 Biotech. 2018;8(2):126. Calviño M, Messing J. Sweet sorghum as a model system for bioenergy crops. Curr Opin Biotechnol. 2012;23(3):323-9. Tang CC, Li SB, Li M, et al. Bioethanol Potential of Energy Sorghum Grown on Marginal and Arable Lands. Front Plant Sci. 2018;9:440. Nass. NASS Agricultural Statistics Board, USDA. 2007. Taylor SH, Hulme SP, Rees M, et al. Ecophysiological traits in C3 and C4 grasses: a phylogenetically controlled screening experiment. New Phytol. 2010;185(3):780-91. Zhang Q, Ma J, Qiu G, et al. Potential energy production from algae on marginal land in China. Bioresour Technol. 2012;109: 252-60. Dalla Marta A, Mancini M, Orlando F, et al. Sweet sorghum for bioethanol production: crop responses to different water stress levels. Biomass Bioenergy. 2014;64:211-9. Raghavendra A. Photosynthesis: a comprehensive treatise. Cambridge University Press. 1998. Dohleman FG, Long SP. More Productive Than Maize in the Midwest: How Does Miscanthus Do It? Plant Physiol. 2009;150(4):2104-15. Kim S, Dale BE. Global potential bioethanol production from wasted crops and crop residues. Biomass Bioenergy. 2004;26(4):361-75. Somerville C, Youngs H, Taylor C, et al. Feedstocks for lignocellulosic biofuels. Science. 2010;329 (5993):790-2. Hattori T, Morita S. Energy Crops for Sustainable Bioethanol Production; Which, Where and How? Plant Production Science. 2010;13(3):221-34. Sanchez OJ, Cardona CA. Trends in biotechnological production of fuel ethanol from different feedstocks. Bioresour Technol. 2008;99(13):5270-95. Zhao YL, Dolat A, Steinberger Y, et al. Biomass yield and changes in chemical composition of sweet sorghum cultivars grown for biofuel. Field Crops Res. 2009;111(1-2):55-64. Bennett AS, Anex RP. Production, transportation and milling costs of sweet sorghum as a feedstock for centralized bioethanol production in the upper Midwest. Bioresour Technol. 2009;100(4):1595-607. Propheter JL, Staggenborg SA, Wu X, et al. Performance of Annual and Perennial Biofuel Crops: Yield during the First Two Years. Agronomy Journal. 2010;102(2): 806-14. Lee TSG, Bressan EA. The potential of ethanol production from sugarcane in Brazil. Sugar Tech. 2006;8(4):195-8. Yu JL, Zhang X, Tan T. Ethanol production by solid state fermentation of sweet sorghum using thermo tolerant yeast strain. Fuel Process Technol. 2008;89(11):1056-59. Maw MJ, Houx JH, Felix BF. Maze, sweet sorghum, and high biomass sorghum ethanol yield comparison on marginal soils in Midwest USA. Biomass Bioenergy. 2017;107:164-17. Shen F, Liu R. Research on Solid-State Ethanol Fermentation Using Dry Sweet Sorghum Stalk Particles with Active Dry Yeast. Energy Fuels. 2009;23(1):519-25. Smith GA, Bagby MO, Lewellan RT, et al. 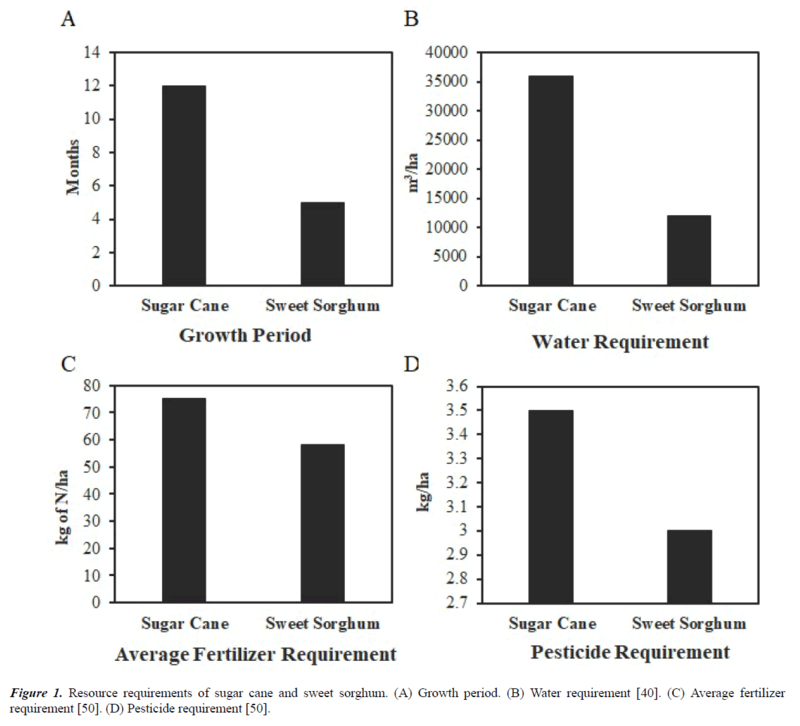 Evaluation of Sweet Sorghum for Fermentable Sugar Production Potential. Crop Science. 1987;27(4):788-93. Lingle SE,Viator RP, Johnson RM, et al. Recurrent selection for sucrose content has altered growth and sugar accumulation in sugarcane. Field Crops Research. 2009;113(3):306-11. Renouf MA, Wegener MK, Nielsen LK. An environmental life cycle assessment comparing Australian sugarcane with US corn and UK sugar beet as producers of sugars for fermentation. Biomass Bioenergy. 2008;32(12):1144-55. Jackson PA. Breeding for improved sugar content in sugarcane. Field Crops Res. 2005;92(2-3):277-90. Matsuoka S, Ferro J, Arruda P. The Brazilian experience of sugarcane ethanol industry. In Vitro Cell Dev Biol Plant. 2009;45(3):372-81. Boddey RM, Alves BJR, Urquiaga S, et al. Bio-Ethanol Production in Brazil. Biofuels, Solar and Wind as Renewable Energy Systems. 2008:321-56. Almodares A, Hadi MR. Production of bioethanol from sweet sorghum: A review. Afr J Agric Res. 2009;4(9):772-80. Balat M, Balat H. Recent trends in global production and utilization of bio-ethanol fuel. Appl Energy. 2009;86(11): 2273-82. Wu X, Staggenborg S, Propheter JL, et al. Features of sweet sorghum juice and their performance in ethanol fermentation. Ind Crops Prod. 2010;31(1):164-70. Murray SC, Sharma A, Rooney WL, et al. Genetic Improvement of Sorghum as a Biofuel Feedstock: I. QTL for Stem Sugar and Grain Nonstructural Carbohydrates. Crop Science. 2008;48(6):2165-79. Liu SY, Lin CY. Development and perspective of promising energy plants for bioethanol production in Taiwan. Renewable Energy. 2009;34(8):1902-7. Berenguer MJ, Faci JM. Sorghum (Sorghum Bicolor L-Moench) yield compensation processes under different plant densities and variable water supply. Eur J Agron. 2001;15(1):43-55. Schittenhelm S, Schroetter S. Comparison of drought tolerance of maize, sweet sorghum and sorghum- sudangrass hybrids. J Agron Crop Sci. 2013;200(1):46-53. Steduto P, Katerji N, Puertosmolina H, et al. Water-use efficiency of sweet sorghum under water stress conditions gas-exchange investigations at leaf and canopy scales. Field Crops Research. 1997;54(2-3):221-34. Barbanti L, Grandi S, Vecchi A, et al. Sweet and fibre sorghum (Sorghum bicolor (L.) Moench), energy crops in the frame of environmental protection from excessive nitrogen loads. Eur J Agron. 2006;25(1):30-9. Mastrorilli M, Katerji N, Rana G. Productivity and water use efficiency of sweet sorghum as affected by soil water deficit occurring at different vegetative growth stages. Eur J Agron. 1999;11(3-4):207-15. De Vries SC, Van De Ven GWJ, Van Ittersum MK, et al. Resource use efficiency and environmental performance of nine major biofuel crops, processed by first-generation conversion techniques. Biomass Bioenergy. 2010;34(5):588-601. Smith GA, Buxton DR. Temperate Zone Sweet Sorghum Ethanol-Production Potential. Bioresource Technol. 1993;43(1):71-5. Rexen F. The non-food dimension in EEC research programmes. Ind. Crops Prod. 1992;1(1):1-3. Lynd LR, Wyman CE, Gerngross TU. Biocommodity engineering. Biotechnol Prog. 1999;15(5):777-93. Chen F, Dixon RA. Lignin modification improves fermentable sugar yields for biofuel production. Nat Biotechnol. 2007;25(7): 759-61. Lynd LR, Wyman C, Laser M, et al. Strategic Biorefinery Analysis: Review of Existing Biorefinery Examples. In: NREL Subcontract Report (ed Report NS) 2005. Regassa TH, Wortmann CS. Sweet sorghum as a bioenergy crop: literature review. Biomass Bioenergy. 2014;64:348-55. Degroote H. Maize yield loss from stem borers in Kenya. Int J Trop Insect Sci. 2002;22(2):89-96. Rajkumara S. Lodging in cereals - a review. Agric Rev. 2008;29(1):55-60. Zegada-Lizarazu W, Monti A. Are we ready to cultivate sweet sorghum as a bioenergy feedstock? A review on field management practices. Biomass Bioenergy. 2012;40:1-12. Gatehouse JA. Prospects for Using Proteinase Inhibitors to Protect Transgenic Plants Against Attack by Herbivorous Insects. Curr Protein Pept Sci. 2011;12(5):409-16. Shewry PR, Jones HD, Halford NG. Plant Biotechnology: Transgenic Crops. Adv Biochem Eng Biotechnol. 2008;111:149-86. Vermerris W. Survey of Genomics Approaches to Improve Bioenergy Traits in Maize, Sorghum and SugarcaneFree Access. J Integr Plant Biol. 2011;53(2):105-119. Anami SE, Zhang LM, Xia Y, et al. Sweet sorghum ideotypes: genetic improvement of stress tolerance. Food Energy Security. 2015;4(1):3-24.